According to the JP’s Sports & Rock Solid Promotions website Show hours for Sunday January 15th, 2017 are from 10:00 a.m. to 4:00 p.m. Admission: Adult $10.00 per day. Kids under 12 are FREE. Frank Robinson is a former Major League Baseball outfielder and manager who had a 20 year career as a player from 1956 to 1976 and played for the Cincinnati Reds, the Baltimore Orioles, the Los Angeles Dodgers, the California Angels and the Cleveland Indians. Following his playing career Frank Robinson was manager from 1975 to 2006 who began as a player/manager for the Cleveland Indians in 1975. He continued as manager for the Indians until 1977, then managed the San Francisco Giants, the Baltimore Orioles, the Montreal Expos and the Washington Nationals. Frank Robinson was a two-time World Series Champion for 1966 and 1970 and was inducted into the Baseball Hall of Fame in 1982, earning numerous honors as National League Rookie of the Year for 1956, Gold Glove Award for 1958, National League MVP in 1961, American League MVP, World Series MVP plus Triple Crown for 1966. PFP Sports Talent Agency is a top booking agent for motivational sports speakers and celebrities. 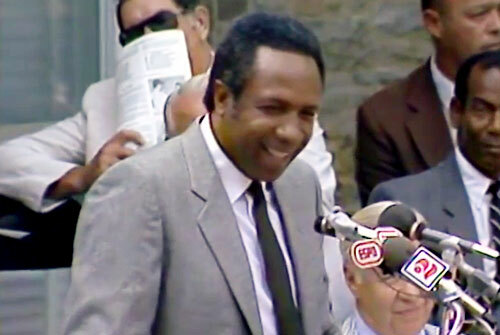 If you would like to book MLB stars like Frank Robinson for a speaking engagement, personal appearance or special event, you can request Frank Robinson agent and speaker information from PFP Sports Talent Agency or call 800.966.1380.